Facilitating a booksprint is challenging, but facilitating a booksprint when there is already some content written was going to be really tricky. Luckily I had the co-hosts Wikimedia Deutschland and Creative Commons on hand to help with ideas. There were around 25 of us at the booksprint over the course of the day, made up of a predominantly OER and open source software crowd. We started off with some general introductions. Elly Köpf talked about the work Wikimedia Deutschland are doing relating to OERs including their recent OER-Konferenz 2013. John Weitzmann from Creative Commons Germany and Alek Tarkowski from Creative Commons Poland gave an introduction to their open education work and mentioned recent activities looking at OER policy. The European Open Edu Policy Project brings together a coalition of international experts associated with CC to strengthen the implementation of open education policies across Europe. I also gave an introduction to the LinkedUp Project, the Open Education Working Group and the current state of the handbook. My slides are on Slideshare. It was important to point out to attendees that this was to be a mini-booksprint and quite different from other booksprints. Firstly we already had some content (produced from the first booksprint, the timeline event and online activity), and secondly we were unlikely to have produced a book ready to be published by the end of the day. The aim of the day was to take the next steps in a 2-year effort to build a collaborative open education handbook. After a Spectogram to get us warmed up everyone split up into groups and started brainstorming around 1) Who is the audience for the open education handbook? 2) How should it work? Ideas relating to these two questions were meant to feed into formulation of questions that this audience might want to know the answer around the topic areas: Open Educational Resources (OERs), open licences, open textbooks, open badges, open learning and practice, open data and open policy. These topic areas were pulled from the handbook as it currently stood and were not meant to be exhaustive. However, what actually happened is people began to query both the audience suggestions and the current content list of the book. Can a handbook serve such a broad audience equally well? So for example can it work on an informative level (offering practical information to those interested, almost like a ‘Dummies guide’ or a car manual) to both those knowledgeable about open education and those new to the topic. If possibly not, then how can it serve those more interested in high-level discourse and synergies? The conclusion was that the current topic headings didn’t work. Many felt that almost all topics were directly related to OER and that isolating them wasn’t appropriate. There was some agreement that the handbook could be ‘many things to many people’ but to work it needed to divide itself appropriately and be clear about its intentions. So for example it could offer a practical guide to creating OERs – but this would be targeted at educators and labelled as such. It could also offer analysis of synergies between open data and policy, but this would be targeted at high-level managers and policy makers. Ideas began to move away from a flat published handbook to different clusterings of topics. No definite decisions were made around structure though some suggestions were made and these ideas need to be discussed further. If people do have suggestions, maybe they could post them here for discussion? For now the handbook structure remains in flux, but it was important find an approach that would still enable the attendees to contribute content. It was agreed that the current handbook would be broken down into chunks, each chunk being a question (possibly with a set of target audiences). The handbook is now in BookType, an open source book editing software. We were lucky enough to have Lucile Neden from Sourcefabric, who develop Booktype, with us and over the lunch break we set about chunking up the current content. The great thing was that through participating in the booksprint Lucile will be able to take back lots of our feedback to Booktype! After the lunchbreak the attendees divided them selves up into small groups with agreed areas of interest. They then began looking at specific questions that already existed in that area and also using the post-it notes from the morning to create new questions. 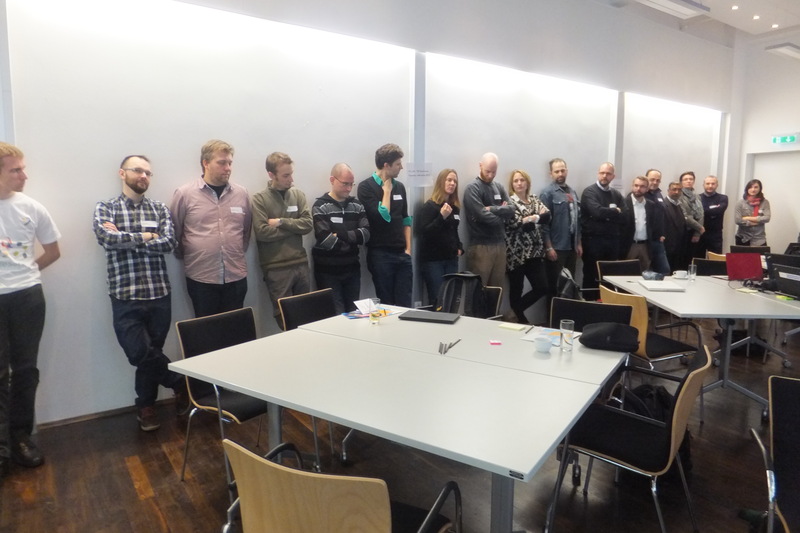 So take the question “How can you use open data to meet educational needs?” – the group would look at this question, consider it’s audience and see if the question had been answered adequately with appropriate resources. If not they would look for more resources to add and links to them. Using Booktype questions were also tagged with a status > new, needs content, completed, to be proofed. Identifying the synergies between different areas of work. This will require more high-level reflection. The second booksprint leaves the handbook in a very different state to the first one. While relatively little actual content has been added to the handbook the important discussions around how it will work as both a community activity and a usable resource are now starting to take place. The handbook itself is now in a more moldable state and ready to reflect the needs of its community. It will also be easier to assign particular questions to people – please do take a look at what the handbook looks like now and contribute if you can. It has been very tricky to capture the interactions that took place at the booksprint but hopefully this will give you a feel for how the handbook is progressing. It seems only natural that the writing of an open education handbook should take place through open practices and in a transparent way. During the day it became apparent that the next steps for the handbook will require much more targeted activity (so for example it would be good to have a think about open learning and teaching activities, it may be useful to put in some work here) alongside the collaborative online approach we are currently taking. We also need to give more thought to the structure, and it’s connections with other online resources. All ideas for another day! Thanks again to Wikimedia Deutschland and Creative Commons for their support, and to all the booksprint attendees. More photographs from the day are available on Flickr. The effort to build a collaborative handbook involving external experts is very challenging indeed, but at the same time it is very important in order to address various stakeholders and to meet their different requirements. 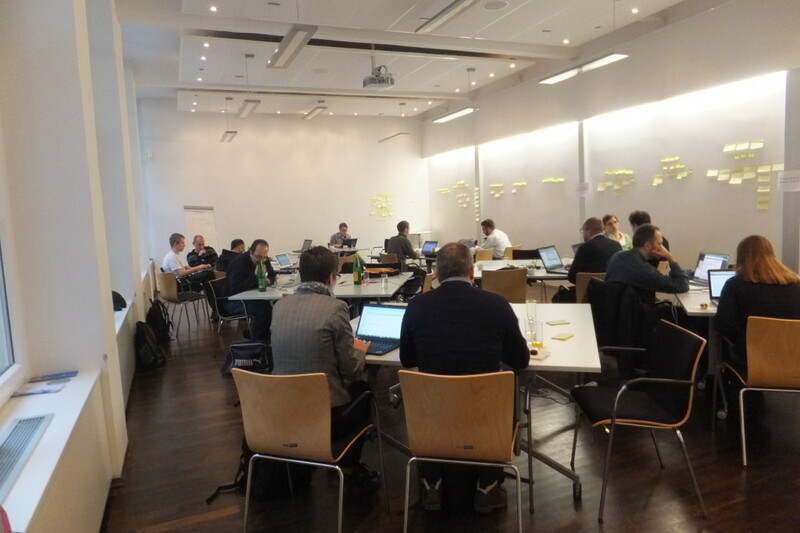 I appreciated very much the opportunity of taking part into the second edition of the Open Education booksprint. The collaborative discussion in Berlin raised valuable issues and suggested promising directions. I encourage the attendees to continue editing content online, as well as to invite additional experts to join the community and contribute their expertise. Many thanks to Marieke who put much effort in organizing and facilitating the booksprint with enthusiasm and professionalism.